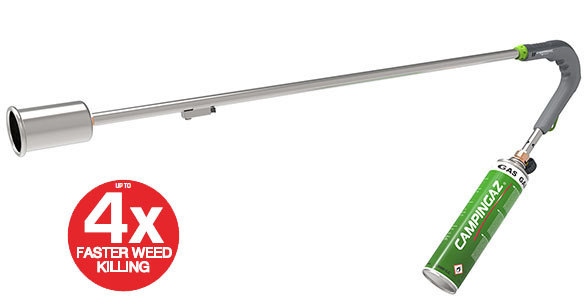 The GT3000 PZ Garden torch is equipped with a bigger and wider burner, in order to kill weeds even more efficiently. The torch GT3000PZ is also extremely light-weight, for a long non-tiring usage and is conveniently equipped with piezo ignition and adjustable flame. Add more power to your gardening experience. Get your garden looking great with the new and improved range of Campingaz® Garden Torches and high performing Garden Gas™ cartridges. The combination of the new lightweight design and Garden Gas™ provides a performance much greater than standard models for your gardening endeavors. Extremely lightweight for easy and non-tiring usage. UP TO 4x FASTER weed killing benefitting from a bigger surface being hit at once.